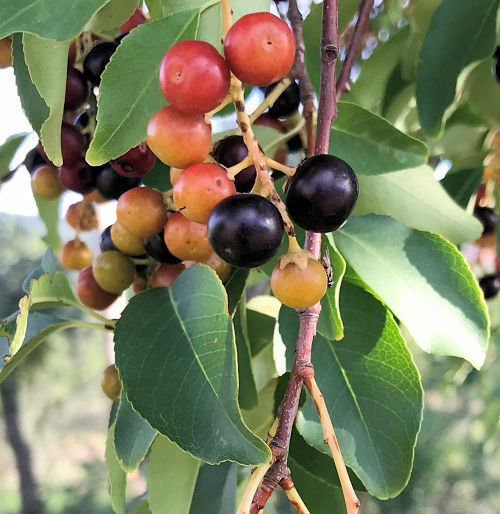 Capulin Cherry, a member of the Prunus genus and the Rose family, is related to plums, peaches, apricots, and sweet cherries. Form: Semi-deciduous tree with umbrella shape. Leaf retention: Evergreen except frost-deciduous. Mature Size: 30' high and 15' wide. Flowers: Five white petals, conspicuous tuft of stamens, in pendulent clusters. Bloom: Late winter to early spring. Under favorable conditions, the tree may have a second bloom late summer. Years before fruiting: 3 from seed. 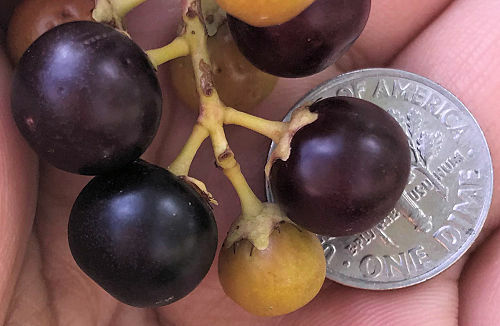 Fruit: Round, 1/2" to 3/4" in diameter, deep glossy maroon to dark purple, thin, tender skin. The flesh is pale green, firm, juicy and sweet, with astringency varying by cultivar from none to overmuch, and has a large pit. The fruit is bad tasting until very ripe. Frequent and extensive watering is said to improve the flavor. Months for fruit to ripen: 3-5. Storage after harvest: The fruit can be refrigerated 4-6 weeks in an uncovered container. Leaves: Aromatic, slender, serrated edges, deep glossy green above, pale grayish-green beneath. New leaves can be reddish. Roots: Its normal roots are shallow, so it is often grafted onto a more vigorous rootstock. 'Ecuadorian', 'Fausto', and 'Huachi Grande' produce larger quantities of good tasting fruit. Wildlife: Attracts bees, birds, and mammals. Toxic / Danger: All parts of the plant are poisonous except the ripe fruit. USDA hardiness zones: 9-10. Withstands 19°F with only small branch damage. Chill hours: None, unusual for a Prunus species. Heat tolerant: It needs extra water above 90°F. Water after becoming established: Daily to weekly when fruiting. Heavy watering improves flavor. Soil: Well drained, low organic content, pH 5.6-6.5 (acidic to slightly acidic), somewhat tolerant of other well-drained soils, but not salt tolerant. Fertilize: Apply compost late winter. Mulch: With compost to minimize water evaporation and heat stress. Planting: Not recommended for containers. First Year Care: Protect from frost. Stake carefully to prevent damage from strong winds. Prune: Can be pruned into a fruiting hedge. Remove damaged branches in mid to late winter. Litter: Low except unharvested fruit and seasonal leaf changeover. Propagation: Hardwood cuttings. Seed, which does not breed true and may not produce quality fruit. 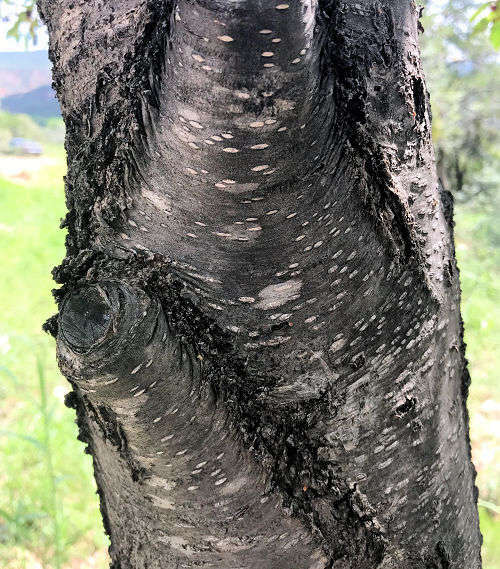 Pests: Less prone to disease than other stone fruit trees, such as sweet cherry. Its former scientific name is Prunus serotina v. salicifolia. This plant is popular where it grows naturally in Mexico and South America between 4000 and 9000 feet in elevation. It is considered difficult to establish below those altitudes. Some nurseries sell a Sweet Cherry (Prunus avium) cultivar named 'Capulin'. That is not the same species.